In this groundbreaking book, Akbar Ahmed, one of the world's leading authorities on Islam, who has worked in the Muslim world but lives in the West, explains what is going wrong in his society by referring to Islamic history and beliefs. Employing theological and anthropological perspectives, he attempts to answer the questions that people in the West are asking about Islam: "Why do they hate us?" "Is Islam compatible with democracy?" "Does Islam subjugate women?" "Does the Quran preach violence?" These important questions are of relevance to Muslims and to non-Muslims alike. Islam Under Siege points out the need for, and provides the route to, the dialogue of civilizations. September 11, 2001, underlined the role of Islam in our time. In its demographic spread, its political span, and its religious commitment, Islam will be an increasingly forceful presence on the world stage in the twenty-first century. While some scholars predict that there will be a clash of civilizations, others see a need for a dialogue of civilizations. This book will help students, scholars of politics, sociology, international relations, and cultural studies, and reporters as well as a more general audience interested in some of the most important issues of our time. Chapter 1 Islam under Siege. i The Return of Anthropology and the Final Crusade. ii The Sense of Muslim Siege. Chapter 2 What is Going Wrong?. i Is it about Islam or is it Globalization?. Chapter 3 Ibn Khaldun and Social Cohesion. ii The Man in the Iron Cage. Chapter 4 The Failure of Muslim Leadership. ii. Veiled Truth: Women in Islam. Chapter 5 Searching for a Muslim Ideal: Inclusion. i Case Study One: The Scholarship of Inclusion. ii Inclusivists in America: Islam in Toledo, Ohio. Chapter 6 Searching for a Muslim Ideal: Exclusion. i Case Study Two: The Scholarship of Exclusion. ii Exclusivists in America: The Debate in Cleveland, Ohio. Chapter 7 Toward a Global Paradigm. i The Challenge for Islam. ii Questions for our Time. "Above all, this is a courageous book. Ahmed uses his knowledge of the Koran and anthropology to confront his co-religionists with uncomfortable truths about women, honour, social cohesion and leadership at a time when Islam is confronting all major world religions"
"In my view there surely cannot be a more relevant book ... one of the most distinguished Muslim scholars today, Professor Akbar Ahmed offers us a clear vision that has the potential to unite us in common action and purpose. It is one of the most hopeful books as well as one of the most challenging I have read in recent years." "Ahmed paints a frightening picture of a world reverting to a more primitive state. This is an honest attempt to describe the problems Muslims face. without absolving them entirely from blame. Western readers should reciprocate in kind." "This new book is written in a language that is understood in the West and is readily accessible...Ahmed explains convincingly the moral collapse of societies in what he calls our "Post-Honor World"..."
"Bold and provocative, its penetrating cultural analysis will challenge Muslims and Westerners, demanding a more sophisticated consideration of what is occurring in the world"
"Ahmed's book is an immense contribution to understanding a contemporary, dangerous world. No course on contemporary Islam or global studies should be deemed complete without this work. Both the Muslim and non-Muslim worlds owe Ahmed a great debt for this piece of honest, hard-hitting scholarship." "It is rare to find a book this is so theoretically sophisticated and yet to readable ... It is a book that one can give to a friend or neighbor who wants to make sense of Islam and the world today as well as assign to graduate students in Islamic Studies and political science ... If there is a better book about our post-9/11 world, this reviewer has not yet seen it. Hopefully, it will receive the widest possible readership." "Islam Under Siege should be required reading for policy makers in Washington, Europe and the Islamic World. It deserves to be translated into all of the major languages of the Middle East and South Asia." 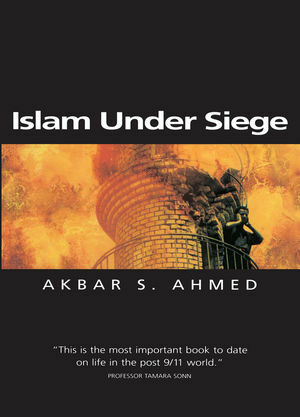 "It is a pleasure to read Ahmed's Islam Under Siege. One need not agree with every sentence and every phrase of any author. But if the author has been honest to his profession and made readers think, his contribution is seminal. Ahmed succeeds in doing precisely that." "Islam Under Siege is an honorable quest to capture and analyze the dishonorable conduct of human society in a post honor world. Just like an alarm clock that rings in your head it forces you to wake up from the pretentious slumber we are so used to. In fact this book keeps you awake long after you are done reading it." Examines the role of Islam in the 21st century and its increasingly forceful presence on the world stage. Written by a Muslim and leading social scientist (who has worked in the Muslim world but lives in the West), the book explains what is going wrong in society by referring to Islamic history and beliefs. Attempts to answer the key questions people are asking about Islam: "Is Islam compatible with democracy?" "Does Islam subjugate women?" "Does the Koran preach violence?" Identifies the need for, and provides the route to, a dialogue of civilizations. A must-read for those interested in the future relationship between east and west and the implications for both cultures.